Harper’s long-running Modern Classics series is first listed in the Cumulative Book Index, Catalog of Copyright Entries and a few other contemporary sources in 1917. The series had at least two jacket and book redesigns after the initial series was published (around 1929 and 1949) and reached over 70 titles by the early 1960s. 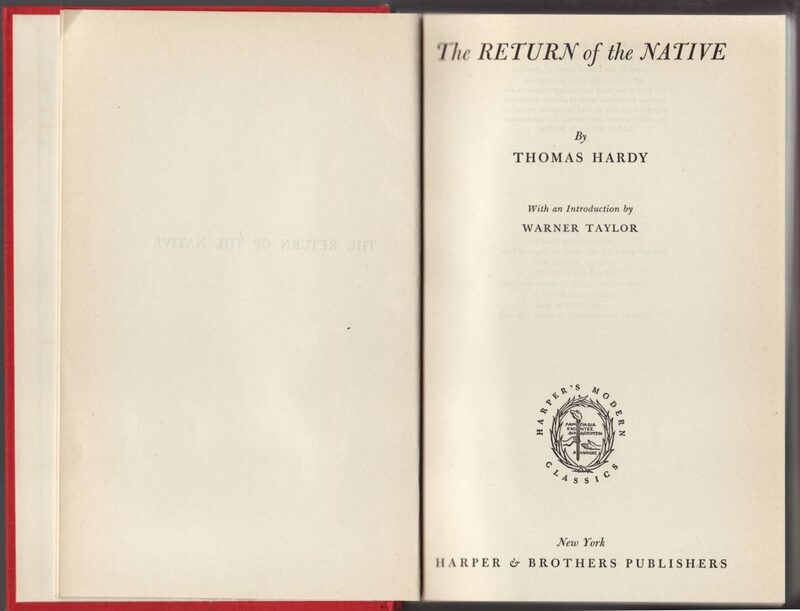 Titles were reprinted until at least 1968. Harper’s Modern Classics series initially consisted of Harper back catalog titles and was edited for “educational use” by Professor W.T. Brewster (Columbia University). 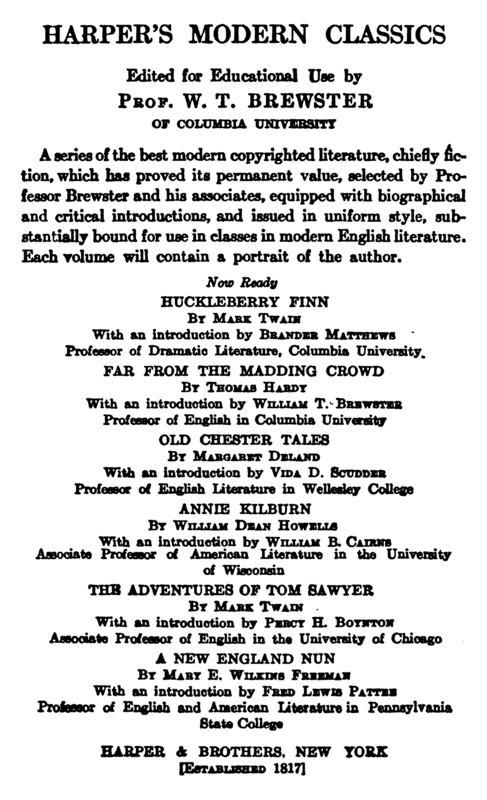 Advertisements from 1920 (from the back of a copy of Van Dyke’s The Story of the Wise Man and The Mansion, Harper & Brothers, 1920) indicate six titles in the series with more to come. 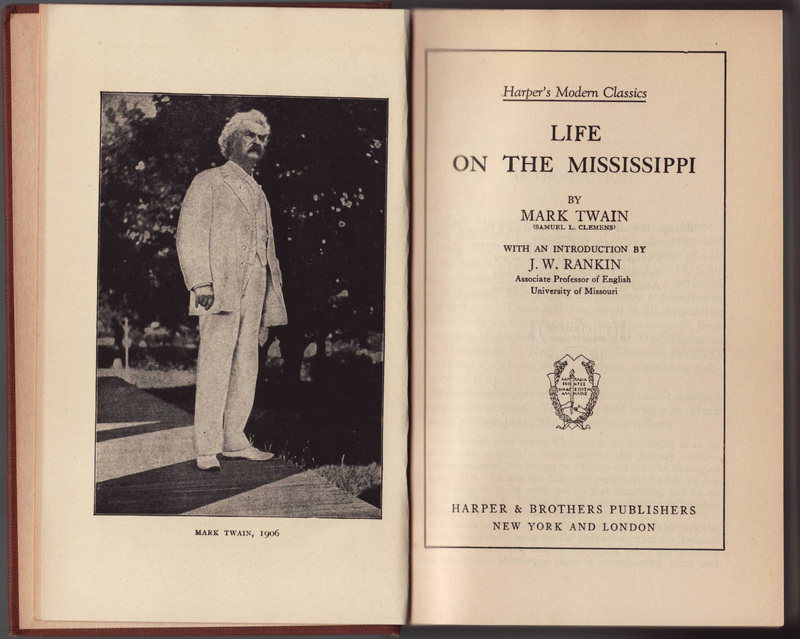 Among the Twain titles in the series, some were the first inexpensive editions of his books. 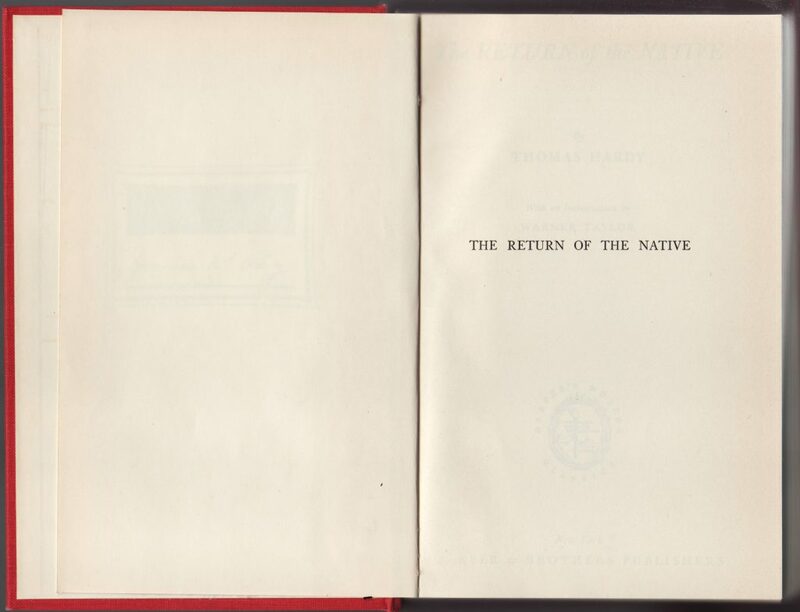 Titles seem to have been rather slowly added to the series between 1917 and 1923. 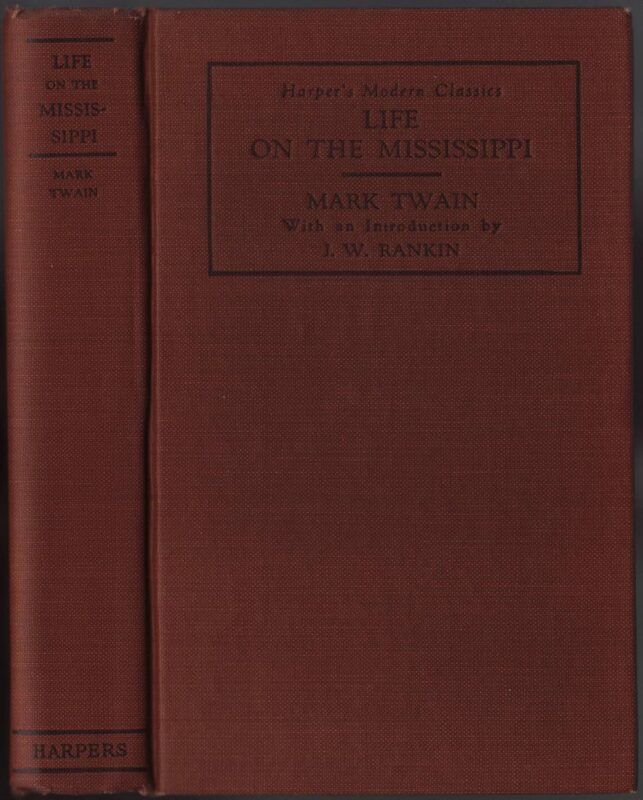 This copy of Twain’s Life on the Mississippi does not have a specific printing date but does have a 1923 copyright date which is probably the correct date of printing. This title was among four additional titles added since the advertisement above (from 1920). Jackets are tan paper and share a common, plain design. The price ($1) is printed on the jacket spine. The series name is on the top of the front of the jacket, along with a blurb about the series. 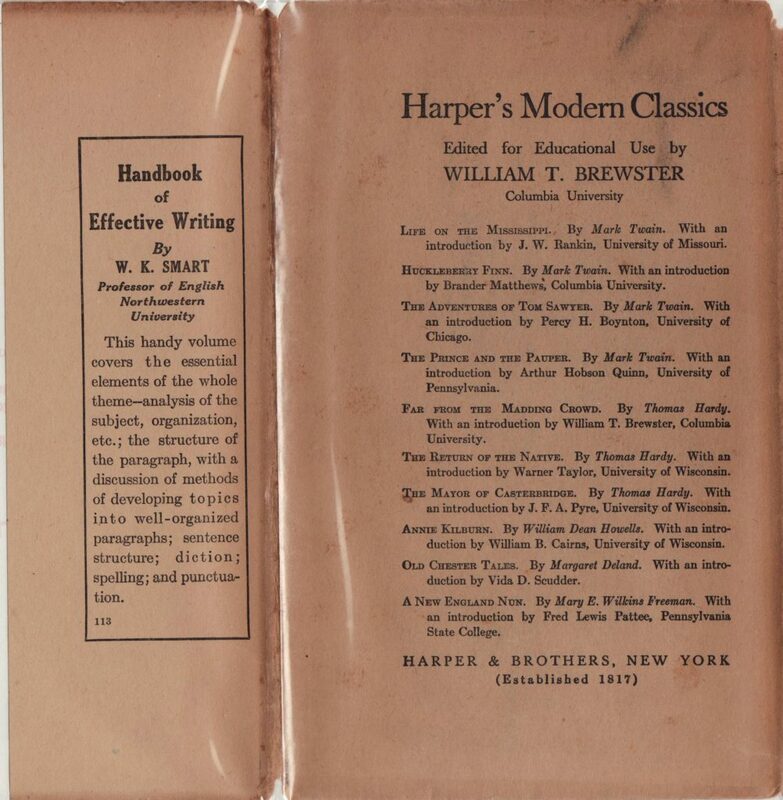 The front jacket flap advertises another Harper’s book (“Flap 149”). 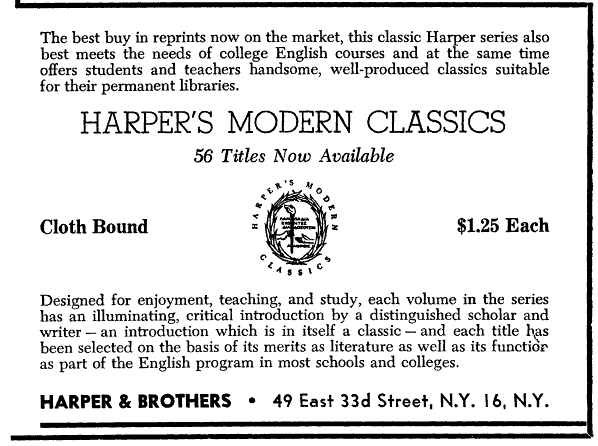 Another Harper’s book is advertised on the back jacket flap. 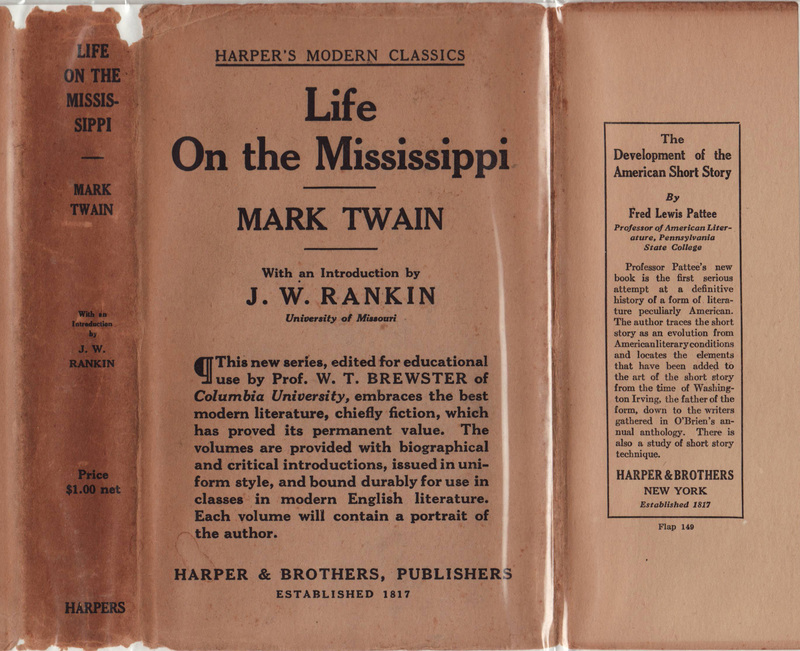 The ten titles in the series are listed on the rear jacket. Bindings are solid brown cloth with black stamping. The series name is printed on the front of the book. 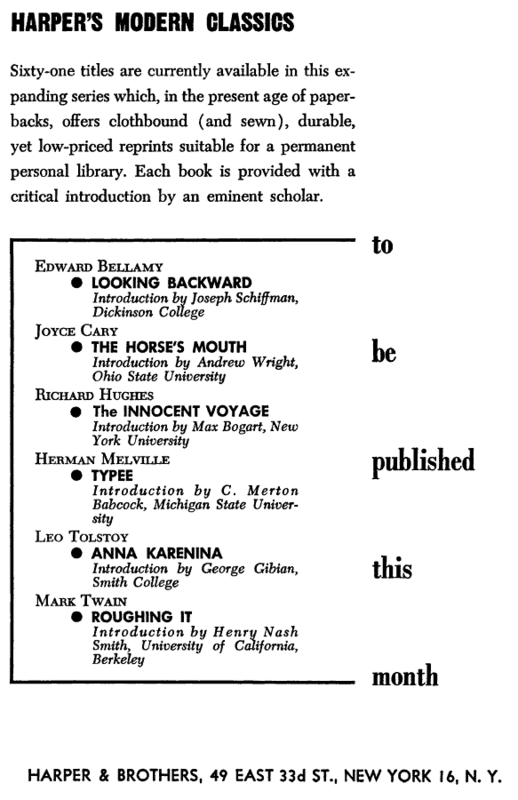 The list of titles repeated from the rear of the jacket. The title page includes the series name and a series (or Harper’s) logo. 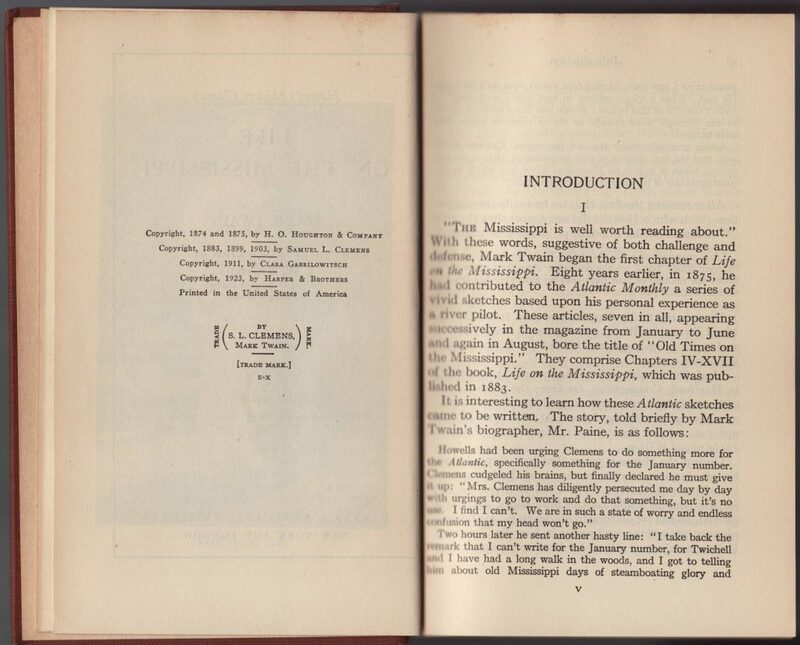 The copyright page includes a string of dates relating to the various copyright holders of the text. 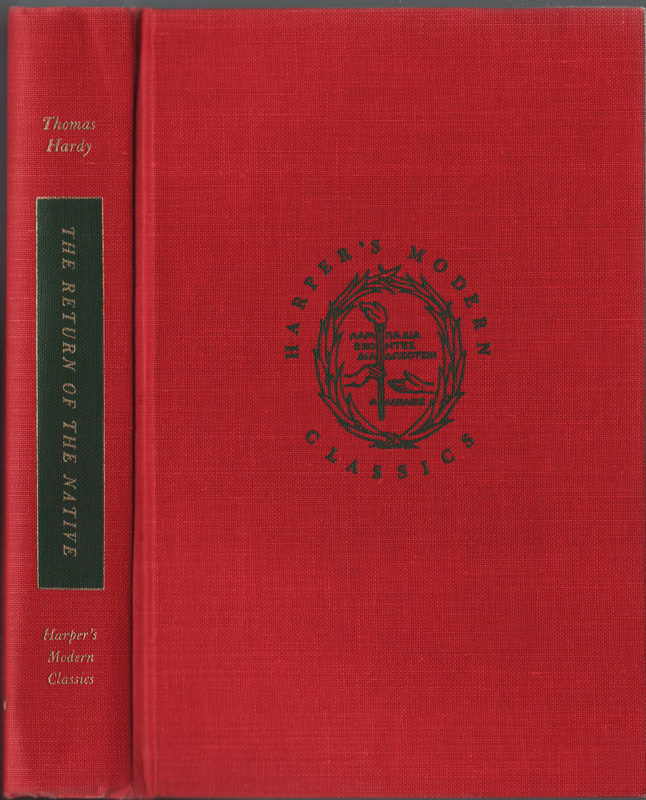 Around 1949 the series was refreshed as the New Harper’s Modern Classics (although the series is still typically referred to as Harper’s Modern Classics). The books are somewhat larger in format and have redesigned textual jackets. The copy of Hardy’s The Return of the Native shown below is not dated, but probably 1949 and among the first few dozen titles in the redesigned series. The price of .95 cents is lower than the earlier series. The jackets are a solid color (usually dark green but sometimes red). The series name is on the jacket spine and front cover. A description of the title is on the front jacket flap. The description of the book continues on the rear flap. 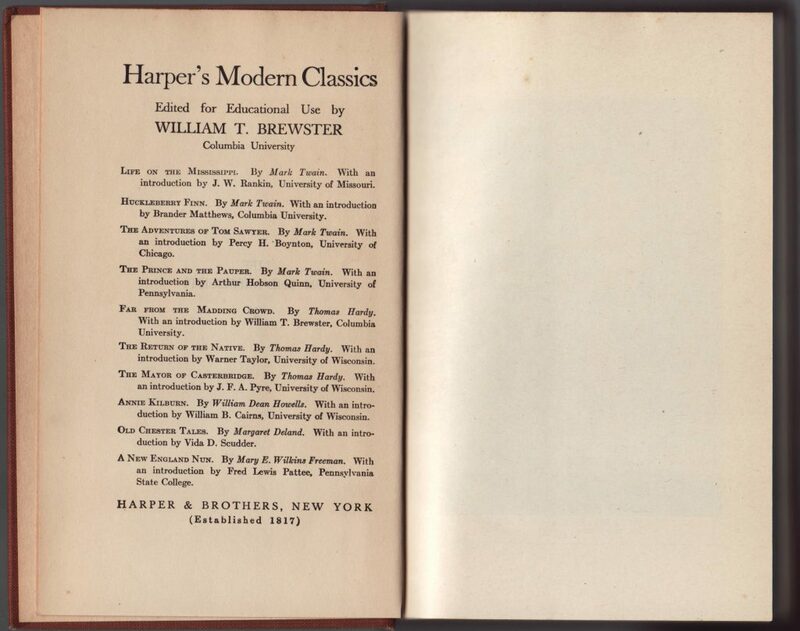 A list of the “New” Harper’s Modern Classics titles indicates 27 in the series at this time. Bindings are now red cloth with the series logo on the front of the book. Gold and black ink are used for text and graphics on the book cover. The series name is included on the bottom of the spine. The book spines are redesigned (and somewhat similar to Modern Library book spines from the same time). 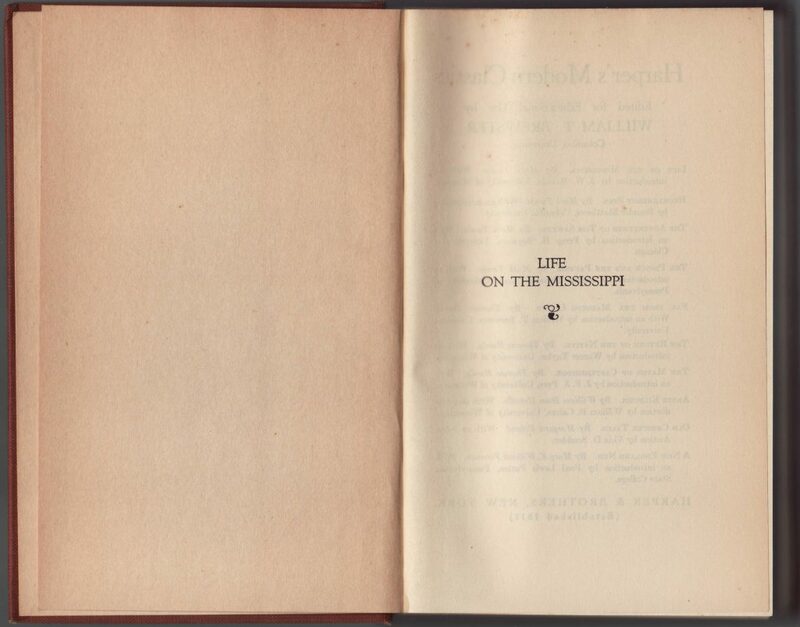 Endpapers are blank except for a printed bookplate on the front left endpaper. 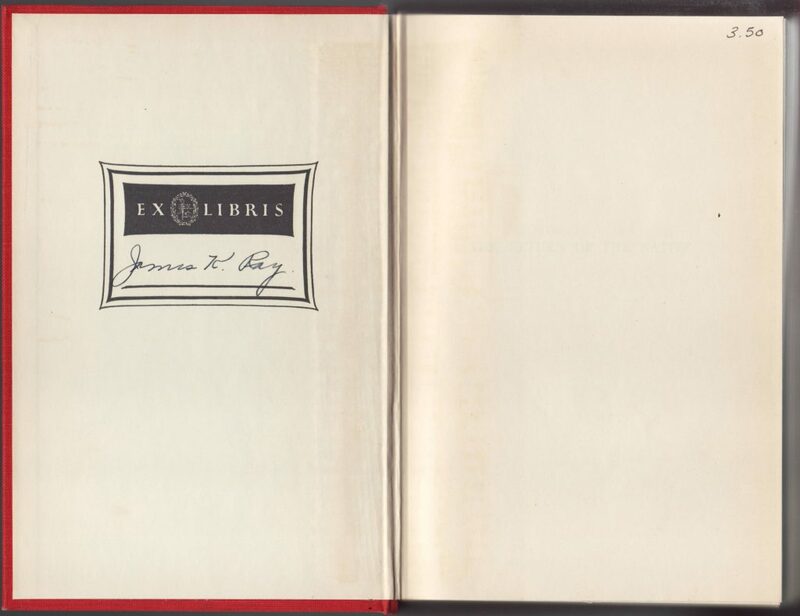 A copy of Henry James’ The Ambassadors is undated, but probably early 1950s. The rear of the jacket indicates 34 titles. 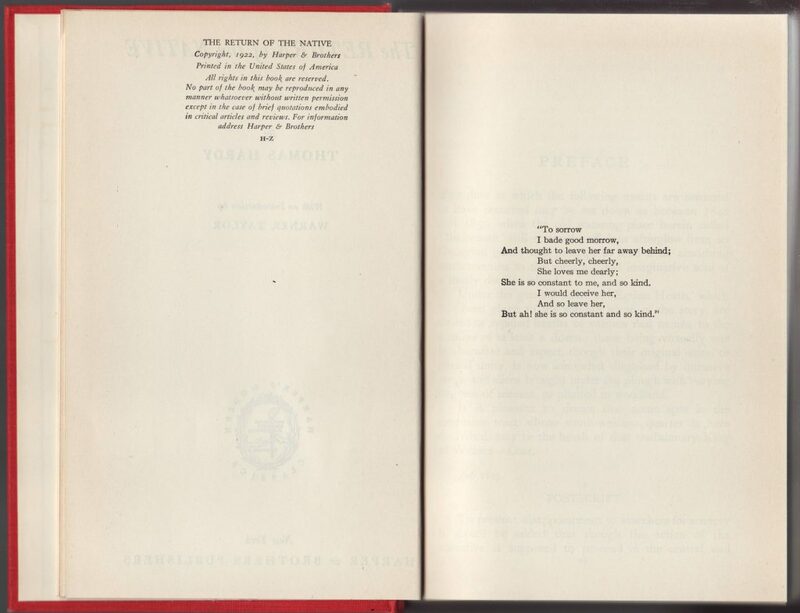 By 1958 there are 56 titles in the series and the price has increased to $1.25. 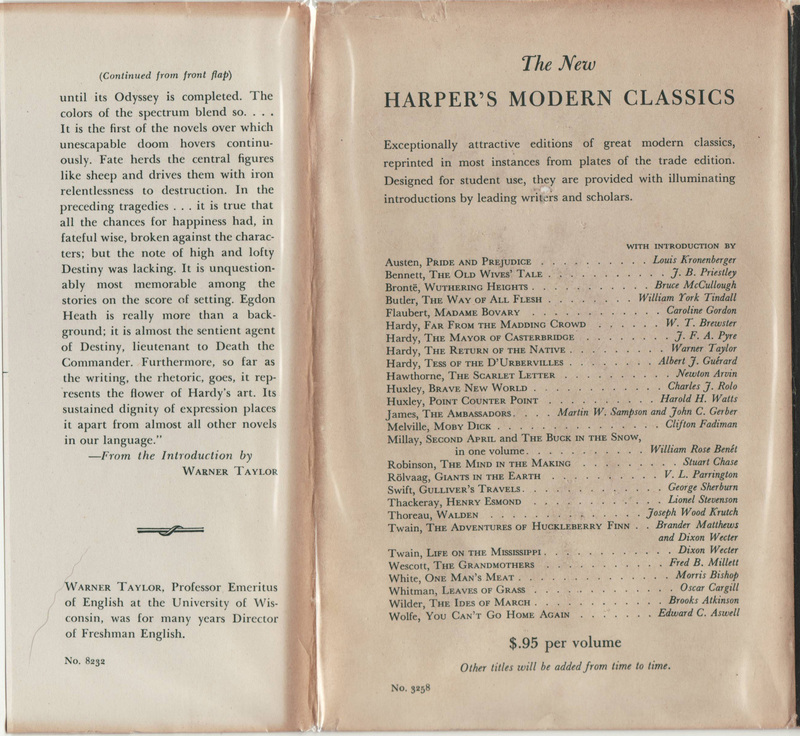 During the late 1950s and early 1960s, Harper advertised the series heavily in educational periodicals. In 1964 an advertisement claims the series has been revised with a new format. Alas, there don’t seem to be copies with 1964 or later dates that look any different from the earlier (post-1949) design. 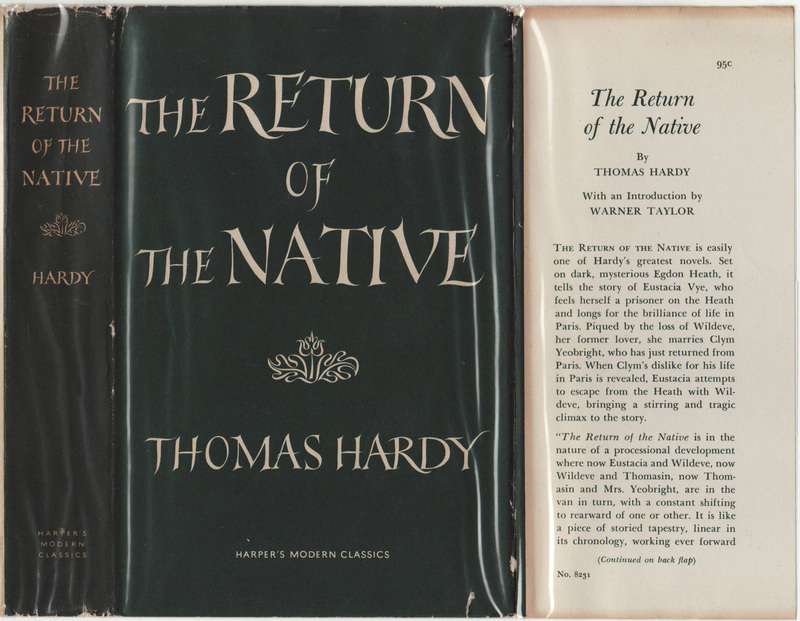 In 1965 Harper began issuing titles in its Perennial Classics series, smaller in format and with completely new jackets and book design. It is possible they scrapped the redesign of the Modern Classics and instead created a new series (with many of the same titles). Both series are available until at least 1967.